Please refer to our stock # 2884/2361 when inquiring. A Chinese jade plaque 17/18 C. very finely carved and pierced with precious objects e.g the canopy, endless knot etc.This reticulated example with its breathtaking virtuosity and delicate , meticulous detail is a fine example of earlier Chinese lapidary art. 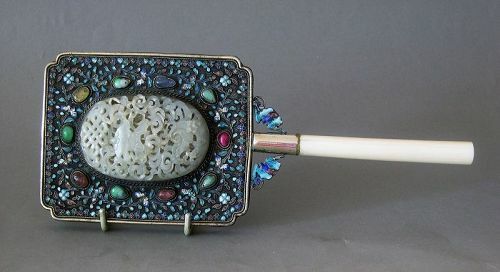 The stone is of greyish celadon hue with spots of whitish clouds and is set on the back of a hand mirror in a frame of gilt silver which is worked with a ground of filigree and multi colour enamel decoration. All is enhanced with semi precious stones mounts. The handle is of ivory. condition: very good, some age tarnish on the silver. size: overall 27 cm.